The prophet Micah was speaking to Israel again, asking a very simple question with a very easy to understand answer. I don’t know about you, but I’ve always found it difficult for me to learn things slower than a lot of people around me. When I was going to school, from the 5th grade all the way to the 12th and even into my college years; instruction in the form of teaching me, and me comprehending and understanding to make it applicable in my life was always a struggle. I remember once when I was getting barely D- grades in advanced math classes. I was really struggling in the way the teacher was teaching me. I just couldn’t get the basic fundamentals down; because he was teaching me above what I was able to comprehend. Then I had new math teacher, where everything he taught, I understood, and my math grades went from D- to B, so sometimes our ability to learn is not more that we are unable to learn, more that we need simple, basic, patient instruction. Things haven’t changed much since those days to now as a child of God, I’m being asked to follow God, trusting Him, and submitting to what I need to do to grow spiritually. The problem, is I struggle with doing everything right all the time! Thank God that He knows my framework and He made me the way I am. In His eyes, I am no better or worse than all others He’s created. Some of us have ‘smarts’ some don’t. Some of us learn faster than others. But, God has made us all unique, in a special way that especially in our defects, if you will; God made us that way that we might lean even more on Him, and learn all about relationship and how we are to get along with God and each other. In the same way, God is giving the people of Israel yet another patient, simple classroom instruction on relationship issues with Him. It seems that these people have tried to come to God in wicked ways. Before this Micah has accused the leaders. Now he accuses the people. They don’t seem to have a clue on how God wants people to live. Micah wants to bring a little hope to *Israel. The people in *Israel need to obey God’s *covenant. Only then will the nation have peace and safety. Do to your neighbor (to other people) what is fair and right. 2, You must love kindness. Some people are not as strong as you, some are poorer than you, so you need to be kind to them, help them, because you want to do it, not because someone is telling you to do it, be happy about it, there’s no greater feeling in the world! 3. Finally, we must walk humbly with God. The first two are what God tells us what we should be doing toward each other. This one involves our actions towards God. To walk or live humbly before God is to agree to what God wants for us. We should want what God wants for us. This means that our moral behavior is more important than memorizing rules and traditions of our faith. When we walk humbly with God, we practice how to love God; and put them into action by doing good things for our neighbors. And Jesus answered him,“The first of all the commandments is, “Hear, O Israel, the Lord our God is one Lord; and you shall love the Lord your God with all your heart, and with all your soul, and with all your mind, and with all your strength.” This is the first commandment. God wants us to live for Him. And He wants our love. God has shown to *Israel’s people what is evil. He’s done it through Micah’s message. Now God shows to the people what is good. The leaders were ‘hating what is good’ (Micah 3:2). They had been proud. So they were not humble. They were the opposite. The leaders had lived without God. They did not consider Him important. God had no part in the way that they lived. A basic part of God’s character is this. He always does what is right and fair. Also, He always loves kindness (Isaiah 30:18). These are the things that we should be doing. How we relate towards each other reveals how we are relating to God. If we are in right fellowship with God, we will desire to live humbly before Him, and be thankful that He has been merciful with our lives. What if we received what we deserved? We’d all be living a a miserable life wouldn’t we? Do what you know is good, love mercy, and live humbly before your God. 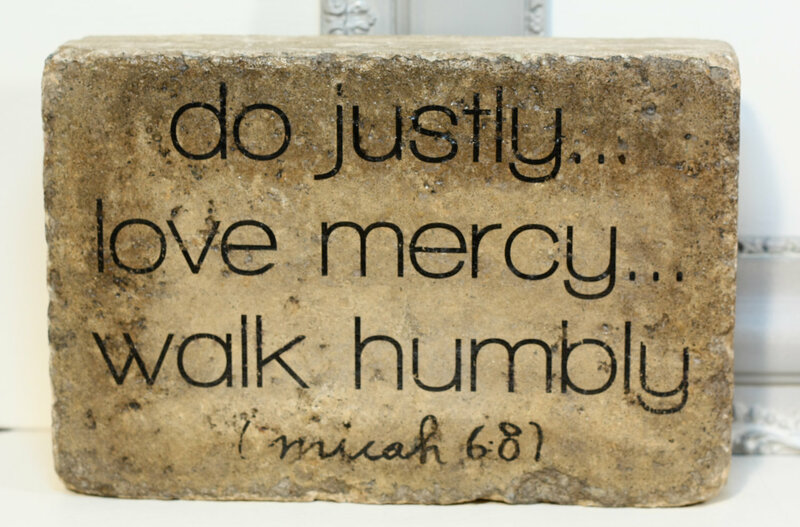 It seems so simple doesn’t it… to do justly, to love mercy and to walk humbly with our God… but at times is harder than it should be… especially the walk humbly… Lord help me to do these simple things… Great Video!